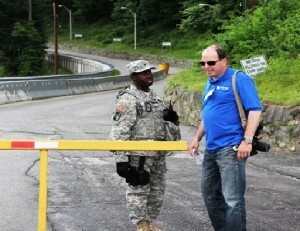 Captain Mark Getman, (R) Deputy Public Affairs Officer of the New York Guard portrays a local reporter attempting to access Camp Smith Training Site from the Force Protection soldier during an exercise for local first responders held in June at the training site. CAMP SMITH TRAINING SITE, CORTLAND MANOR, N.Y. -- Two members of the New York Guard’s Public Affairs Office played the role of reporters in support of an emergency response exercise here June 13. Capt. Mark Getman and Officer Candidate Donald F. Ferguson portrayed local news media to exercise the Camp Smith security and response procedures for handling unexpected media arriving at the gate during emergencies. The two helped prepare Camp Smith garrison staff leaders to better communicate with news media during a crisis. “Informing our local residents through the press is an integral part of our emergency plan. So it makes sense to test our media plan and make changes if needed,” said Lt. Col. Joseph Cetta, Camp Smith Training Site Garrison Commander. “The New York Guard Public Affairs team played a key role by asking the kinds of questions real reporters would ask in an emergency." he added. The exercise rehearsed emergency evacuation procedures at Camp Smith and included the New York Army National Guard, US Marine Corps personnel, Life Net of NY Air 2 from Wallkil, the Continental Village Fire Department Rescue, Cortlandt Regional Paramedics, and Peekskill Community Volunteer Ambulance Corps. The rehearsal simulated emergency treatment, stabilization and evacuation of injured occupants from a vehicle crash in a remote, woodland area.